“Many successful entrepreneurs around the world wouldn’t be where they are today if not for IIT” says Hiran Wickramasinghe, an Executive Director of Informatics International (Pvt) Ltd and Director of Informatics Holdings (Pvt) Ltd.
Having joined the Informatics Institute of Technology (IIT) in 2001, Hiran is glad that he made this initial decision. 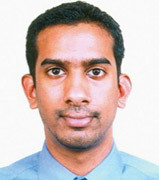 Not only did the Institute afford him an opportunity to study right here in Sri Lanka but also ensured that his final degree – Information Systems from the Manchester Metropolitan University UK – was conducted of the highest standard by IIT both nationally and internationally; given the exposure and depth of knowledge learnt at IIT. Speaking to the alumni of IIT, and especially Hiran, the general sentiment when speaking of their college is that IIT speaks for itself. One only needs to take a look at its past students and see that almost every single person who has graduated from IIT now enjoys successful positions in leading industries all across the world. The support spoken so highly of, originates not only from the lecturers but also from the close knit community of students .. Although a batch can contain up to 200 or more students – in both the full time and part time classes, each student is given personal attention. Every effort is made to encourage all students to actively participate not only in education related matters but also in sports, extracurricular activities, and social activities. This is an essential practice. Most students studying at various other institutions tend to move only in one direction. However at IIT an all round achievement for every single student is a goal that is strived to be achieved. The curriculum structure incorporates assignments that involve team building, presentations and communication activities.Enhancing skills of listening, effective communication, attention to detail, documentation etc are invaluable skills that go a long way when ultimately dealing with clients and engaging in business. “The placement year in the third year of study really puts the knowledge we gained into perspective when working in a real business environment. “Students are able to execute what they learnt in their first and second year of study during their placement and thereby gain insight into the real business world. Hiran had the opportunity to do his placement in Norway, which is another area IIT supports and encourages should there be an opening overseas. Industry giants especially in the International arena are impressed and have high regard for IIT students because of the high standards achieved. In fact most have been impressed to learn that certain successful IIT alumni have gained their foundation in Sri Lanka. The dedicated lecturers too have an immense role to play in this regard. Not only does IIT attract industry experts to lecture at the Institute but also brings in immediate past students who have won gold medals and other prestigious awards to teach the juniors. This approach is vastly productive as these young lecturers are more in tune with the students and can understand their problems better and relate appropriately to them. “I truly enjoyed my years at IIT and I’m glad that it has a family culture incorporated into its system. There is more to education than just academics and I think this is where IIT has truly set itself apart” said Hiran.